When it comes to preschool-aged kids, some are in a formal school setting while others are in a daycare or home setting during the day. This will have an effect on how they respond to activities around the house. Some will do best with free play, while others could benefit from some structured play time. 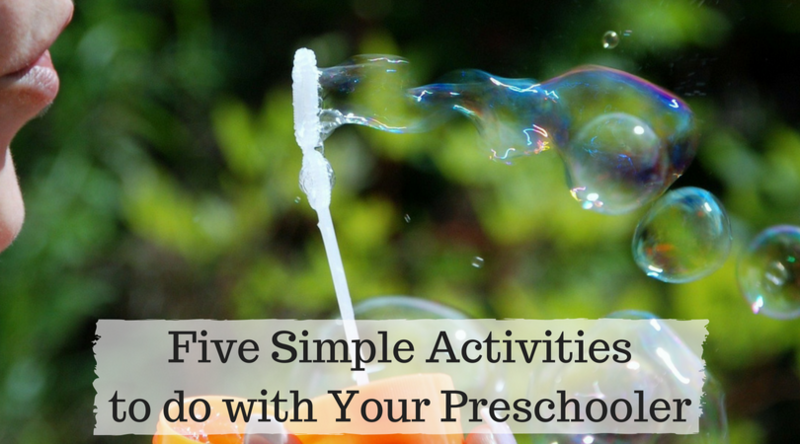 Today, I’m bringing you five different activities that you could do with any preschooler, regardless of their schooling experience. You may have noticed a trend – books are always at the top of my list as an activity to do with kids. In previous posts, I talked about how you could use them with babies and toddlers. Preschoolers are able to interact with books in new ways and will benefit greatly from daily exposure. Preschoolers are starting to develop a sense of self and have an opinion on what they do and don’t like. Allowing them to pick out their own books can make reading together a positive experience. Preschoolers are also able to engage with you while you read so it’s important to actually talk about the story and pictures rather than simply reading the words on the page. Music can also be used for entertainment at this age. Put on a few songs and enjoy a dance party together. Or let your child make their own music with objects from around the house. There are a lot of creative opportunities waiting when it comes to kids and music. Preschoolers are at an age where art projects are a fun learning opportunity. Doing art at home presents you with the opportunity to work on coloring, cutting, gluing, and so many other skills that they will need in the classroom and eventually life. Art doesn’t have to be complicated. It can be as simple as pulling out some blank paper and crayons and allowing your child to create. It can also be more complicated and use a variety of tools and supplies. My favorite way to find new ideas for kid-friendly craft projects is to browse Pinterest. Preschoolers are taking in more of the world around them and getting ready for the school years ahead. They are like little sponges taking in new things every day. This makes it the perfect time to start working on some of the basic skills they’ll need later, including letters, numbers, shapes, and colors. For some parents, the thought of teaching at home is a scary one, but it doesn’t have to be. Many of these skills can be taught in simple ways each and every day. For example, you could count the animals in a book that you’re reading. When putting on clothes, you could talk about the color of each item. At this age, learning is fun and kids typically enjoy it. Preschoolers are still a fan of the simple activity of exploring. Take your little one outside or to a new location and let them discover new things. Take time to talk about the items that they find and interact with – this will help expand their knowledge base and language skills. Not sure where to start with exploring? I recommend your own backyard or neighborhood. There are so many cool things simply waiting to be discovered if you allow your little one to lead the way. It’s always best to supervise for safety reasons, but I highly recommend letting them lead the way. You never know what they might introduce you to! Preschoolers are at a stage where the activity ideas are truly limitless. They’re learning and picking up new skills daily. They love talking and are starting to tell you about the things around them. Take time to talk and listen each and every day. This will help them grow and learn in so many ways. I love hearing your thoughts and ideas! Do you have any favorite activities to do with a preschooler?